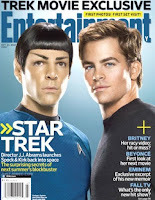 SykoFilm: Spock and Kirk on Entertainment Weekly Cover! Spock and Kirk on Entertainment Weekly Cover! Entertainment Weekly had a big Star Trek feature, and Zachary Quinto and Chris Pine appeared in costume as Spock and Kirk on the cover. EW also had photos from their visit to the set. Let's all drool at the cover together. Don't you think this movie is going to be good?